Katie Couric Gun Documentary Undermined By Manipulative Editing In the film, Couric asks gun owners a question and is met with dumbstruck silence. That's not what happened in the interview. Instead, NPR's David Folkenflik says, it was a foolish directorial choice. Katie Couric (right) and White House Senior Adviser Valerie Jarrett, speaking, participate in a panel discussion following a May 16 screening of Couric's documentary Under the Gun at the U.S. Navy Memorial in Washington. Katie Couric and the creator of a documentary on guns are apologizing — to a point — for switching around footage to make it falsely appear that members of a Virginia gun rights organization could not summon an answer to a key question on background checks. An audiotaped recording taken by one of the participants shows otherwise — they spoke extemporaneously for several minutes. "That was not a tough question," Philip Van Cleave, president of the Virginia Citizens' Defense League, told NPR. He said he observed the interview in person as it occurred. "That was not a question that our members would not know the answer to. It's kind of like sins of omission." 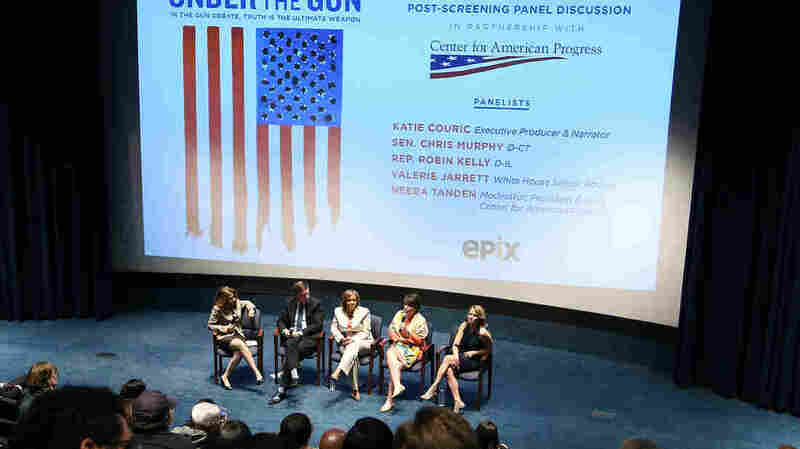 The documentary, Under the Gun, focuses on issues of gun violence and safety. In April 2015, Couric interviewed members of the league in Washington, D.C., for the film. One of her questions: "If there are no background checks for gun purchasers, how do you prevent felons or terrorists from purchasing a gun?" In the film, nine seconds of silence ensue as members of the gun rights group are shown looking away or at the floor. In audio posted on the website Ammoland and shared with the Washington Free Beacon, Couric asks a slightly longer version of the question, even saying she knew what their answer would be. She is immediately met with responses. "One, if you're not in jail," one man says, "you should still have your basic rights, and you should go buy a gun." "So if you're a terrorist or a felon?" Couric prods. "If you're a felon, and you've done your time, you should have your rights." A second participant weighs in, as does a third. No stunned silence. No nine seconds' abeyance. After Van Cleave attacked Couric and the documentary, its director and producer, Stephanie Soechtig, issued a statement citing the wide range of views presented in the documentary and apologizing. Sort of. "My intention was to provide a pause for the viewer to have a moment to consider this important question before presenting the facts on Americans' opinions on background checks. I never intended to make anyone look bad and I apologize if anyone felt that way." Couric simultaneously released this statement: "I support Stephanie's statement and am very proud of this film." Asked how Couric reacted when she saw that portion of the film before its release, a spokesman for the project said, "Katie questioned the pause, but the director made the decision to use it to lead into the discussion of the hole in background checks." This manipulation — and that's what it was — would not pass muster at NPR under its principles for fairness in handling interviews. It should be noted that documentaries operate with a different ethos than straight news. Under the Gun has a take, strongly suggesting there is a quiet consensus in favor of background checks among gun owners, aside from gun rights advocacy groups. This is not deception on a grand scale, but this handling of the interviews with the Virginia gun owners group is clearly unfair and unwarranted. People deserve to recognize themselves in how they appear in interviews. To show the gun owners blank-faced for an extended time didn't provide a pause for the viewer — it wiped away the notion these people had an answer to hear. The deception reflects poorly on Couric, too. She conducted the interviews, serves as the movie's executive producer and has promoted it extensively. She saw a polished cut of the documentary before its release. She apparently expressed doubt about the insertion of the pause but failed to get it removed from the film. Regardless, those nine seconds — fleeting moments for the film — amount to a team loss on an unforced error. Van Cleave, the head of the Virginia gun owners group, said he came away from the interview with a largely favorable impression of Couric. He said that her questions were tough but fair, and that she played the devil's advocate but never attacked. "Nothing in the interview made me think she would do what she did," Van Cleave told NPR. "We've got to be able to trust the press."